About High Road Chipstead’s High Road ground is rural. Not just “surrounded by a few trees” rural but one where you can literally hear cows mooing and sheep baahing. It is a far trek out into the countryside but that gives it an almost surreal feeling watching a game here. The good news is that it is very picturesque. The bad news is that it can get damn chilly in the winter! The ground is basic. One small four row stand that covers a third of the touchline and then a small cover over one part of the end behind the goal and that is it. The club does have a nice clubhouse, accessed through the entrance by the main turnstiles. Huge Sky Sports screen and decent beer plus a view of the action from inside. Food wise there is a small hatch behind the main stand which cooks fresh food but no chips! How to get to High Road The car is king in getting to Chipstead. There is a station in the village but it is around 1 1/2 miles away and is a walk uphill all the way along country roads without pavements. Coulsdon South where you can get a cab relatively easily and it will cost about £5. Trains run from Victoria to Coulsdon South for evening games (3 every hour) and from London Bridge on Saturdays (2 every hour). By car then you need to come via the A23 (either from junction 7 on the M25 heading north on the M23 which soon becomes the A23, or south from Croydon on the A23). Follow A23 towards Coulsdon and take the Coulsdon bypass signposted M23 and Gatwick. At the second set of lights after leaving the by bypass turn right into Star Lane – there is a BP garage on the corner. Follow Star Lane into Elmore Road, keeping the church and the green on your left until reaching the crossroads with High Road. Turn left (signposted Lower Kingswood & Reigate) and parking for away supporters is 200 yards on your left. To walk to the ground leave via the car park entrance turn left and the clubhouse and turnstiles are a further 200 yards along the main road. Admission to High Road Adults are charged £8 for admission, concessions is £5 and under 16’s are free. Programmes are available free of charge on the turnstile. Our last visit – March 2011 Frankfurters are not from Frankfurt. Hamburgers not from Hamburg. Port is not from Port Vale and apparently Chips not from Chipstead. Well that was the view of a recent visitor to the Ryman League One South side’s High Road ground in the middle of the Surrey countryside. Football and chips go together in the Non Leagues like groundhoppers and plastic wallets to keep programmes pristine in. Northern Steve has to have a portion at every ground he goes to and gets very grumpy indeed if there is no gravy or curry sauce available. Lolly goes into a weekend long strop if there are no chips on the menu and Lewes’s Terry Boyle has been known to streak if there is a lack of fried potato products on offer at away games. So when a free weekend in the footballing calendar arose for Mr Last and myself we decided to find out if the myth was true. Did Chipstead indeed have no chips? 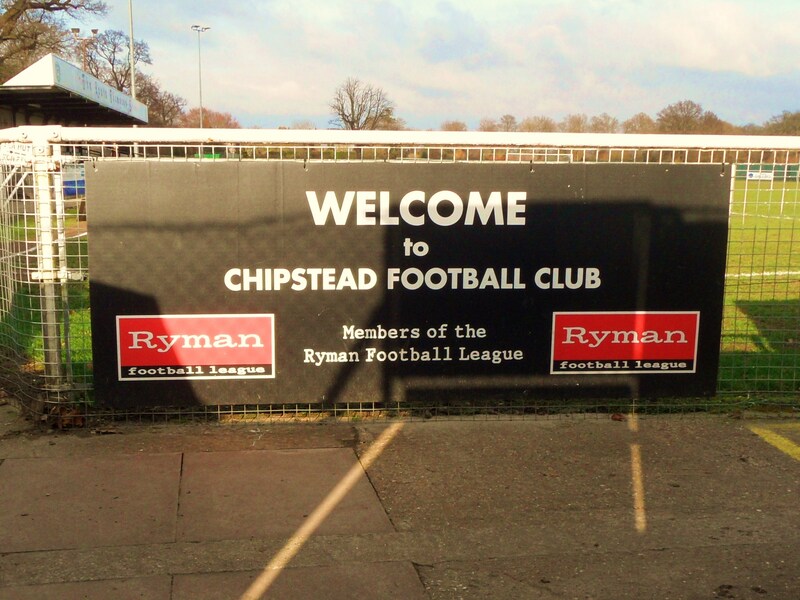 First on the agenda was actually finding a) Chipstead and b) locating the High Road, home of the club. In these modern days finding places isn’t too difficult thanks to a new website I have recently discovered called “Google” (Write it down – it will take over the UK soon I can tell you”. The village of Chipstead is near Banstead in Surrey. Population of around 5,500 midway between the M25 and Croydon. If you are being pedantic, head up the M23 and over the M25 and do a left, go down a big hill and turn right at the cow with the strange shaped udder. It was mentioned in the Doomsday Book no less, as Tepestede. It was held by William de Wateville. Its Domesday assets were: 3 hides; 7 ploughs, 1 mill worth £1, woodland worth 5 hogs. It rendered £8, which ironically was the same price the football club charged for admission to a game at their High Road stadium. Money is not what it used to be worth eh! 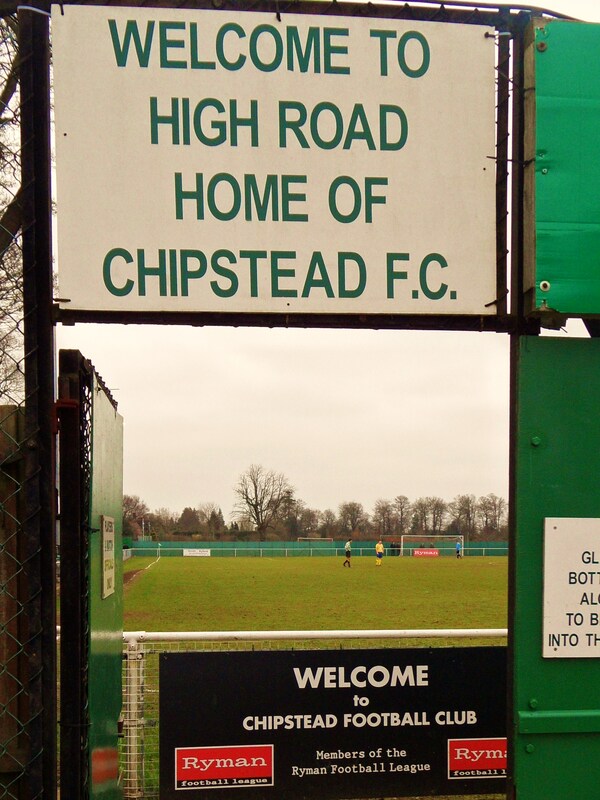 Chipstead F.C. were established in 1906 and were founding members of the Surrey County Premier League in 1982, moving to the Combined Counties League in 1986, and then the Isthmian League in 2007 after winning the league. You may of course remember them from that FA Cup fourth qualifying round tie in 2008 against Torquay United, well at least my chum Luge Pravda does, who can be heard in the bars around Madison Square in New York singing about the “Day the Gulls got their Chips”. Danny and I had discussed travel options during the week. Ideally I didn’t want to drive but the train simply wasn’t an option as we found from the club’s website. The nearest station was over a mile away and the walk to the ground was all uphill and on country roads without pavements. So I elected to drive and we sailed into the car park of High Road just in time for the opening of the bar. And what a lovely bar it was too with a huge screen showing Sky Sports, Bombardier on draft and memorabilia galore adorning the walls (which apparently showed us that Geoff Hurst won the World Cup for West Ham in 1966). *Trivia Fact of the day. Chipstead FC’s High Road ground was used in the filming of Footballers’ Wives. With average crowds around the 80 people mark it wasn’t really brave of Mr Last to stick his 50pence on an attendance of 86 in our pre-match sweepstake, although he appeared to have the last laugh in the Golden Goal after I picked the 1st minute. You couldn’t get much more mid-table than a clash between 10th and 11th. In fact Chipstead had the almost perfect “balanced” record coming into the game of winning ten drawing ten and losing ten this season, with only the goal difference slightly off neutral. Visitors Sittingbourne’s history has been a bit more turbulent than the home side’s. Back in the early nineties they were on an upward curve, climbing the leagues and reaching the Southern Premier League and destined to go further. However, over ambitious expansion plans saw the club move into a stadium that was eventually beyond their means and they came crashing back to earth with a bump. Today, after the painful teenage years the club is relatively established at this level although rumours were abound on the interweb thing that the financial clouds were gathering again as players had apparently not been paid for a few weeks. Could they put it all behind them for ninety minutes? We would see. Chipstead 0 Sittingbourne 1 – High End – Saturday 5th March 2011 This wasn’t the best advert for football to be honest. In fact I cannot really remember much about the game itself. Our job was to try and track down some chips and it was a good job that the action wasn’t too distracting. Chances were few and far between. In fact in the opening forty minutes of the game neither keeper actually made a save. Chipstead came the closest to scoring when big bustling Denba (or so it sounded when the woman next to us shouted his name) got to the byline and pulled the ball back “on the money*” and the ball was blasted over the bar. We headed off to the Tea bar and our fears were confirmed. There was no chips in the ground. A nice freshly cooked bacon cheeseburger helped our disappointment to an extent but as with all of these things pleasure comes at a price. In this instance it was missing the one and only on target effort of the who half when Ryan Golding’s looping header sent the eight (yep all eight of them) Sittingbourne fans behind the goal into raptures. We took solace in the clubhouse, bumping into legendary chairman Len Dawson, resplendent in his club tie and his club flat cap. Len seemed like a chap who has seen it all and was celebrating the decision by the International Board of Association Football to ban Snoods. Such things were never allowed in his day, although boots with real nails in the bottom, flat caps and bits of steak for shin pads were all acceptable. Just don’t get him talking about coloured boots. The second half continued much the same as the first. With all of the talk around football of crap refereeing it was good to report that today’s official kept a low profile, so low in fact that they weren’t listed in the programme at all. Danny was fixated by Chipstead’s central midfielder Jason Thompson. In his expert eye “He simply doesn’t look like a footballer“. No sooner had he uttered the words again than Thompson hit an effort from thirty yards against the cross bar. We spent most of the rest of the second half in the best place there is in Non League football. Positioned between the two dug outs. Here you can hear what the managers really think. You can hear the nicknames of the players, what they actually say to the linesman and some of their inspiration, like:- “Press on”, “Quick release Nutty”, “This technical area is smaller than my living room” And “Who was offside there lino, the holy ghost?” Five minutes to go and we headed back into the warmth of the bar to catch the final scores. News filtered through that our boy Dave Wheeler had rescued a point for the Rooks and with Brighton & Hove Albion and West Ham both winning it had turned into a very good afternoon. And the footballers wives? Well we didn’t see any emerging from the very posh houses in the village but there was one sitting in the stand, giving some moral support to her man by reading a book throughout the game, pausing to fake some interest at full time with a bottle of Lucazade Sport for her man. The final crowd was 101, one of the highest they had had this season. We’d like to think that in our own small way, the “Pele and Maradona” of the football blogging world (Not our words but those of Michael Hudson) were partly responsible for that. Well we did at least turn two figures into three! *After listening to the biggest load of crap ever spoken by a co-commentator on Sky Sports last weekend when West Ham beat Liverpool I now know that the term “on the money” used in every other sentence by Chris Coleman essentially means the penalty spot. More pictures from a fine afternoon of fun can be found here at our Flickr stream.